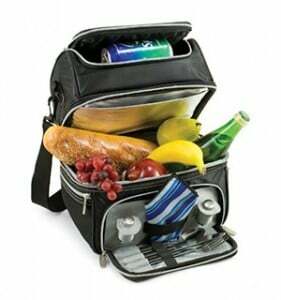 Are you looking for the best lunch cooler for your needs? If so, then you’ve found a right place. Read on..
Have you ever had this happen to you? The day is dragging along and you’re looking forward to lunch. Really, that’s the only thing that’s been keeping you going all day. You finally sit down to take a break, open your lunch cooler and find that the contents are warm to the touch. Your ice pack has already melted and the one thing you were looking forward to is ruined. If only you hadn’t purchased that cheap soft sided cooler to begin with is what you think to yourself. The story above doesn’t have to be yours. We can help you to avoid that from happening. to-middle . . . . Tired of lunches that are warm by the time you eat lunch? That wouldn’t be a problem IF you wanted your food warm in the first place, but what if you just needed your cooler to keep your lunch cold? We can help. Here is a look our top picks when it comes to personal lunch coolers. You’ll have your choice of either getting this in red or blue. The inside of the cooler will allow you to fit six cans (one user reported perhaps less if you decide to use an ice pack). When lunchtime rolls around, you won’t have to search for a table, as the lid reverses to become a serving tray. The tray also has built in beverage holders so your drinks won’t slip. Add in the wide base for stability and you have all you need to accommodate your eating needs. Users of this product reported that it’s the ideal size to fit meals for one or two people. While one user reported that this cooler wouldn’t keep items as cold as it’s larger siblings, the user did say that it did keep items cool for the better part of the day. One user also reported the durability having said that they used it as a seat (the user weighed over 200 pounds). 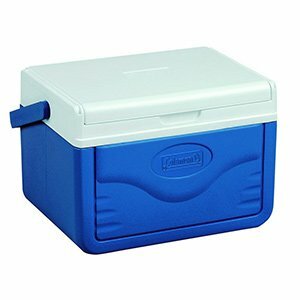 TIP: You may also want to read our Best Coleman Cooler For Sale post. Want to make sure no one accidentally mistakes your lunch can for theirs? Then you may want to pick this up. The Pranzo Lunch Tote comes in a wide variety of colors and designs and is so stylish, that someone may “accidentally” pick it up and walk away with it. 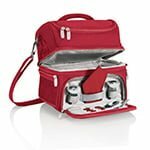 With different sections to hold hot and cold food, you just may find this to be the all-in-one lunch cooler you have been looking for. Pop open the front storage pocket and you’ll find salt and pepper shakers, stainless steel knife, fork and spoon set, as well as a cotton napkin. 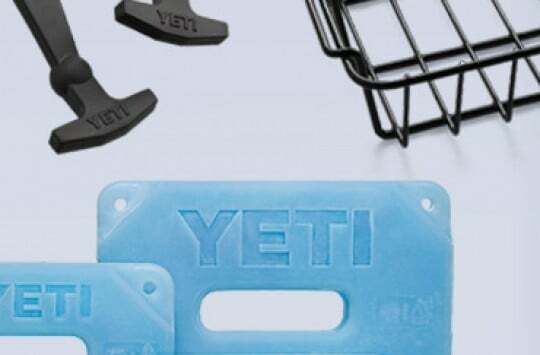 Many users appreciate this for the extreme versatility of being able to pack hot and cold items. Another user really enjoyed all of the extra pockets and mentioned that the special diet they are on allowed for all food items, as well as a food scale to be easily carried in it. One look at this cooler and you’ll swear that you have seen it before, because you probably have. Either you’ve owned one yourself, seen one at the beach or other outdoor event, or even attended a party where someone had one. The tent top that can be found on this cooler helps to prevent spills from happening, while the push button found at the very top makes it easy to unlock for easy opening. 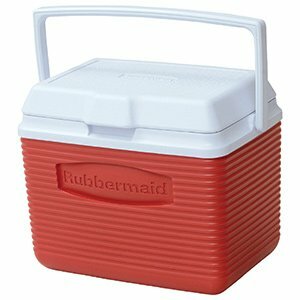 With a lid that opens to either side, you’ll find getting in and out of this cooler a breeze. Nine cans with ice can easily fit, making it ideal for one or even a few people to use. Many users like the size of this cooler, as they are able to fit all of their lunch items. Many also enjoy the easy one click button opening at the top of the cooler, which allows for easy one-handed opening when needed. 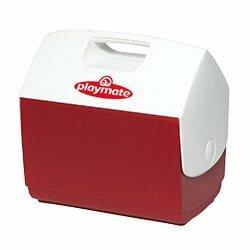 Read full Igloo Playmate review we’ve recently published. This 10-quart Victory cooler can be found in a variety of colors. A top swing handle makes it easy to carry and a large inner area allow you to carry multiple meals if need be. You can fit nearly a 12 pack of cans in this cooler, which should give you a better idea of the size you can expect upon purchase. At first glance, this cooler may look a bit on the larger side, which was what some users reported, but upon using it, many of them stated that it is just the right size. Many also mentioned the interior being easy to clean. One drawback that was mentioned by some users was that the lid was a bit too tight for their liking. However, when it comes to ice retention times, a tight fitting lid is not a bad thing to have. Another user also mentioned the tight fitting lid was a good thing as melted ice stayed in the cooler on trips when it accidentally fell over in the car. What Makes The Best Lunch Cooler? There are several things that make the best personal cooler. The first being that it must fit your specific needs. For instance, if you are in an area where tables and a place to eat can be difficult, then perhaps the FlipLid 6 listed above may be more to your liking. If you find that you cannot easily get condiments, utensils or napkins for your lunch, then the Pranzo may be a cooler you want to take a closer look at. Another thing to consider when choosing the best lunch cooler for your needs is the accessibility. 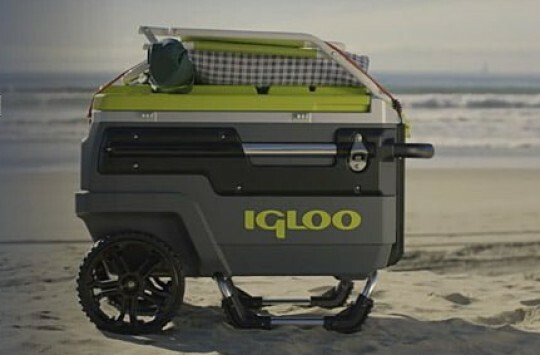 If you are in tight and confined spaces during meal times or constantly on the go, where you may only have one hand free to open up your cooler then you may want to consider the Igloo above, with single push bottom unlocking and a sliding cover making opening much easier. If you are in vehicles all day long, where your cooler may be sliding or tipping over on a regular basis, and you need contents to stay sealed in, then perhaps a tighter lid like the one found on the Victory will be more to your liking. Tip: Check out all lunch coolers available on Amazon. As mentioned earlier, will you need to open the cooler with one hand? Do you need a tighter lid or do you need something that can double as an extra seat? Once you determine the different functions your cooler will need to perform, you’ll then be able to decide on which one to choose. This one is easy as all you need to decide is how much food and beverages you’ll need to pack. There are different sizes to choose from so think about the amounts of food and drinks you will need to carry with you, and you’ll be able to determine the size you will need. Do you need extra pockets to store other items? Do you need to keep some things hot and others cold? If you have a variety of needs, then you will need a lunch cooler that can meets those needs. As you can see, a lot goes into finding the best personal lunch cooler. It’s not as easy as choosing the best cooler on the market. The best lunch cooler for you is the one that will meet your needs the best. We’re certain you’ll be able to find the right one, right here.